Featuring no software installation and free services, PDF Converter online service has been more and more popular during these days. It enables users to convert the original files to other required formats and get output files in a short while without conventional downloading and installation. Here are four good choices for people prefer online PDF Converters. It converts Microsoft Office, Open Office, Lotus, images, web pages and other formats to PDF and image files. Conversion from PDF to other formats is also supported. This free Online PDF converter and PDF creator is quick and reliable. Use the "Select file..." button to locate the document file on your computer and click the "Convert" button. Neevia Technology has been focused on developing software products for people and companies who have embraced the e-document technology in their workplace since 1999. This online converter delivers its goods as usual. Neevia Online Document Converter makes it possible for anyone to instantly convert many of the file formats (doc, docx, xls, ppt..) that are used daily to PDF, PDF/A or Image (tiff, jpg, png). No need to install anything on computer. 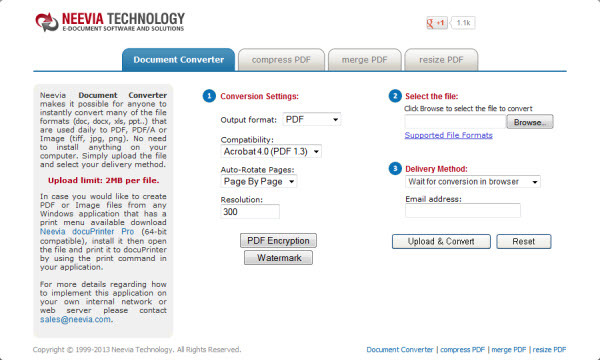 This online PDF Converter provides services to convert PDF to Word and HTML. Conversions from Word and Web to PDF are also supported. Unlike other online PDF Converter, it does not have size limit though the output formats are much less for users to choose. The online Converter is worthy of its name. It is more than a PDF Converter but its document online-convert service is also commendable. It supports to convert PDF to any popular EBook, Image and document formats. •	Users may be not willing to upload the original documents as the files may contain their private information. Everyone thinks in his way. The best one is the suitable one.